Rising from a verdant meadow with a Bodhi tree planted to the west, we are building a replica of the holy Mahabodhi stupa. This stupa will inspire all who see it to find refuge in the gentle path of wisdom, compassion, and peace. 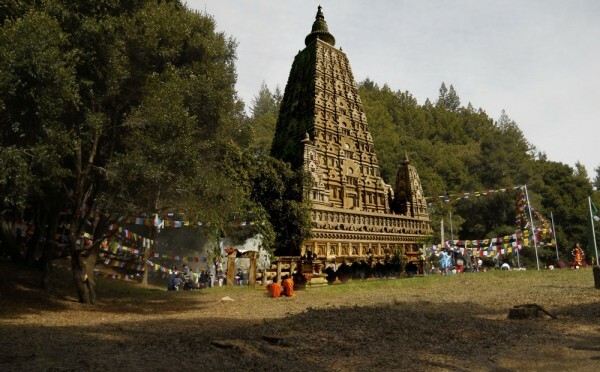 As you walk the path from our Great Prayer Wheel to the upper part of our land you will encounter this venerable stupa, an icon of peace rising from an open meadow. Standing nearly forty feet tall, we are building a replica of the most holy Buddhist pilgrimage site in India. Stupas, one of the most ancient icons in Buddhist art, are powerful symbols of the mind’s limitless potential. In other words, they represent the mind of enlightenment. Stupas are filled with sacred images, mantras and the relics of holy beings. Building or sponsoring a stupa is a very powerful way to accumulate merit and purify negative karma. using a secure server and your credit card. 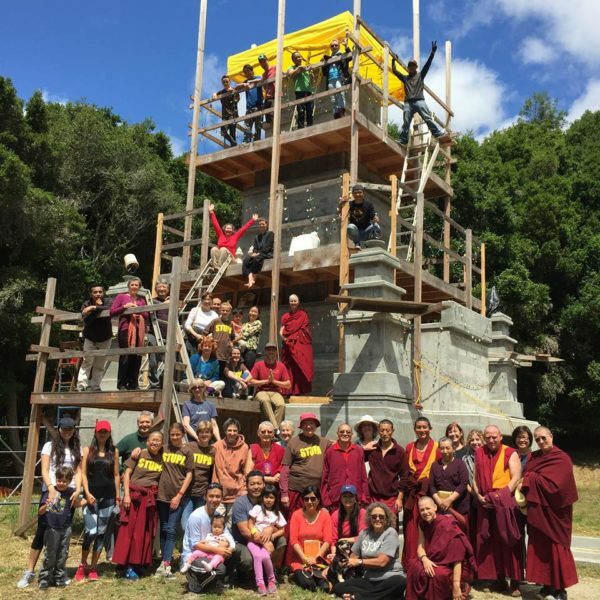 This stupa will be the central axis in a garden which will offer sites to sit and meditate, thousands of memorial stupas, gardens, grown as offerings to the Buddha, places to perform prostrations, ponds with places for peaceful travelers to rest and reflect. The purpose of this stupa is to serve as an inspiration and a blessing to all who visit it. Simply seeing, making prostrations, or circumambulating the stupa will be of benefit to all. Dedicated as a place to promote peace, we will have plaques to honor people such as His Holiness the Dalai Lama, Mother Theresa, Martin Luther King and others who have through their tireless effort created a more peaceful world. Stupas are said to promote harmony, prosperity, longevity, good health, and peace. They bring blessings to the environment in which they are built, to those who build them, and to those who visit and venerate them. In this way, stupas ensure that the living quality of the Buddhist teachings will always be available. 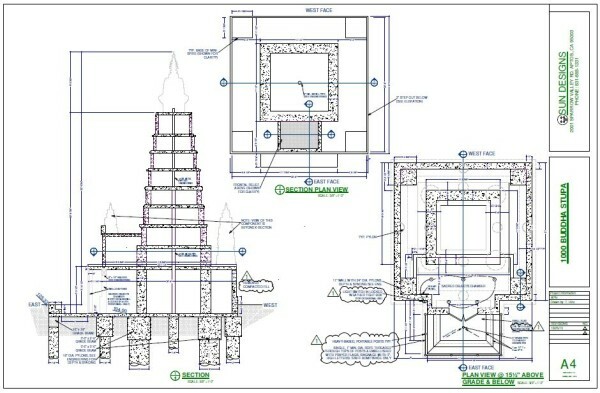 The vision for the Land of Medicine Buddha Stupa Project emerged in the late 1990’s. Tangible progress began in 1999. In the following decade, extensive architectural planning and land analysis work was done to build the 11,000 sq. ft. building modeled after the ancient stupa in Bodhgaya. In 2011, Kyabje Zopa Rinpoche became the central pillar to our Founders Mandala by pledging $50,000 to support the building of our stupa. In January of 2013, the Chew family from Singapore became the second members of our Founders Mandala. We are looking for a few more visionaries to join us in making the building of this great stupa manifest quickly! See engineering and architectural drawings here (PDF). After only a year of design and engineering, in January 2014 we received our permit approval to build our stupa at Land of Medicine Buddha! The bhumi puja to bless the land was held on Friday, April 25, 2014, and on the following Monday, April 28, 2014 construction began. Volunteers from the area helped to fill each chamber of the central tower, finishing the 9th level on May 22, 2016. Two years later, on May 22, 2016, we filled the 9th and final chamber of the central tower. 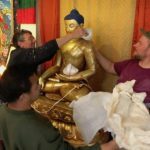 Many hands helped pass along the holy objects – sutras, mantras, tsa-tsas, etc. – from the truck, up the ladders, all the way to the top. All the spaces around the holy objects were packed with fragrant wood shavings and incense. Our Facebook page and YouTube page have ongoing posts with pictures and videos of the progress. Don’t get stuck on the wrong side of the gate. If you are an overnight guest, be sure to keep the gate code with you. If you are a pedestrian, be sure to be off the land before the gate closes automatically at the end of the day. Enjoy your visit. And thank you for coming to Land of Medicine Buddha.